On October 17th, Shout! Factory released special edition Blu-ray and DVD combo packs of the six Studio Ghibli films My Neighbor Totoro, Kiki’s Delivery Service, Princess Mononoke, Spirited Away, Howl’s Moving Castle and Ponyo, which are all directed by the legendary animator Hayao Miyazaki. These updates from the Disney releases not only feature some new bonus features, but they also come packaged with exclusive little booklets featuring images and statements from the filmmakers, to make them even more enticing for collectors. A brief rundown of all six titles is below. 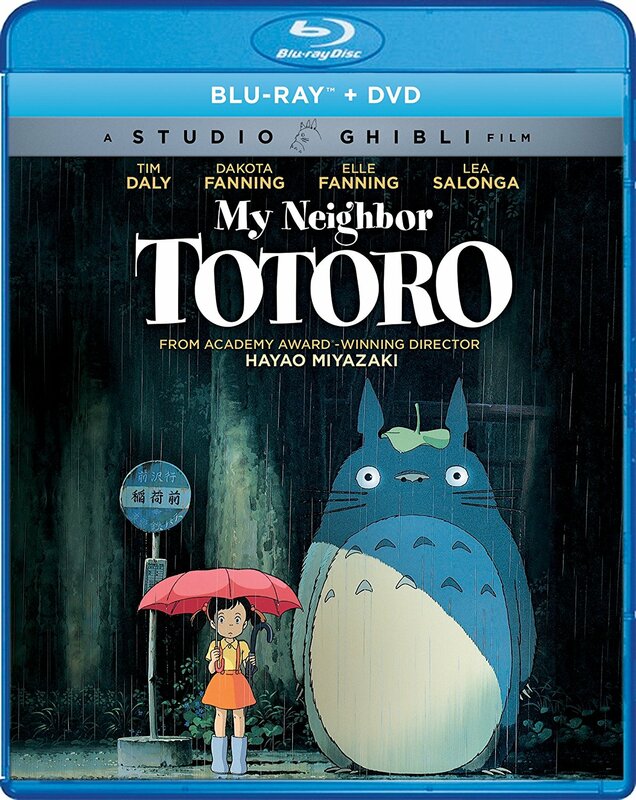 My Neighbor Totoro: First up is Studio Ghibli’s 1988 classic My Neighbour Totoro, which follows sisters Satsuki (Dakota Fanning) and Mei (Elle Fanning) who move to the Japanese countryside with their father (Tim Daly), to be closer to their mother (Lea Salonga) who is in the hospital. The sisters soon discover a magical world in the nearby woods, including a wondrous forest spirit named Totoro, a gentle giant who takes them on adventures. This is an all-ages animated classic that still holds up just as well almost thirty years after it first came out, delivering an absolutely delightful and bighearted experience, that is impressive not only for the gorgeous animation but also for the warm gentleness of its storytelling and characters. The Blu-ray also includes feature-length storyboards, the original theatrical trailers, textless opening and closing credits, and the featurettes Behind the Microphone, Creating My Neighbor Totoro, Creating the Characters, The “Totoro” Experience, Producer’s Perspective: Creating Ghibli and The Locations of My Neighbor Totoro. My Neighbor Totoro is 86 minutes and rated G.
Kiki’s Delivery Service: Released in 1989, Kiki’s Delivery Service is the story of the young witch Kiki (Kirsten Dunst), who follows tradition after turning thirteen and sets off on her own for the first time with her cat Jiji (Phil Hartman) in order to hone her craft. When she lands in a small seaside town in Europe, she gets taken in by a kind baker (Tress MacNeile), and starts a flying delivery service, using her broom. This is an entertaining and beautifully animated coming of age fantasy, that tells a simple but charming story, and still stands as an early classic from the studio. The Blu-ray also includes feature-length storyboards, the original theatrical trailers, and the featurettes Behind the Microphone, Creating Kiki’s Delivery Service, Kiki & Jiji, Flying With Kiki & Beyond, Producer’s Perspective: Collaborating With Miyazaki, The Locations of Kiki’s Delivery Service and Ursula’s Painting. Kiki’s Delivery Service is 103 minutes and rated G.
Princess Mononoke: Released exactly twenty years ago in 1997, the classic animated epic Princess Mononoke follows the young warrior Ashitaka (Billy Crudup), who travels to the western forests seeking a cure for his deadly curse and becomes involved in a deadly battle between Lady Eboshi (Minnie Driver), who is leading a clan of humans into war against the animal gods, and the fearless Princess Mononoke (Yuriko Ishida) who was raised by wolves. With exciting battle sequences, brilliant animation, and a mature story that explores the bond between people and nature, Princess Mononoke remains one of Studio Ghibli’s best offerings. The Blu-ray also includes feature-length storyboards, the original theatrical trailers and TV spots, as well as the featurettes Behind the Microphone and Princess Mononoke in USA. Princess Mononoke is 134 minutes and PG. Spirited Away: Released in 2002, and taking home the Oscar for Best Animated Film, Spirited Away follows a ten year old girl named Chihiro (Daveigh Chase), who is moving to the Japanese countryside when her parents are mysteriously transformed into pigs in an abandoned village, and she becomes lost in a strange world of spirits. Chihiro ends up working for the witch Yubaba (Suzanne Pleshette) in a magical bathhouse, and must find a way to break her spell, to both save her parents and get back to the real world. Entertaining, intriguing and richly textured, this is not only one of Hayao Miyazaki’s finest achievements, but also one of my personal favourite Studio Ghibli films. The Blu-ray also includes feature-length storyboards, the original theatrical trailers and TV spots, the featurette Behind the Microphone, and the Nippon Television Special on the DVD version of the film. Howl’s Moving Castle: Released in 2005, and receiving an Oscar nomination for Best Animated Film, Howl’s Moving Castle follows a young hatter named Sophie (Emily Mortimer), who is cursed to live in the body of an old lady by the jealous Witch of the Waste (Lauren Bacall). She takes refuge in the castle of Howl (Christian Bale), a wizard who lives with his young apprentice Markl (Josh Hutcherson) and the fire demon Calcifer (Billy Crystal) in a gigantic home made of junk that stands on its own legs, and he enlists her help in trying to avoid being drafted by the king to fight in a war against another kingdom. The animation is stunning throughout, with steampunk elements woven into the early 20th century designs of the film, and the complex story is rich with anti-war themes, inspired by Hayao Miyazaki’s own opposition to the invasion of Iraq. The English language version was coincidentally also dubbed at Pixar, with the great Peter Docter serving as co-director. The Blu-ray also includes feature-length storyboards, the original theatrical trailers and TV spots, an interview with Diana Wynne Jones, and the featurettes Behind the Microphone, Miyazaki’s Visit to Pixar, The Birth Story of the Film Soundtrack and Explanation of CG. Howl’s Moving Castle is 119 minutes and rated PG. Ponyo: The most recent of these titles, the 2009 film Ponyo follows Sosuke (Frankie Jonas), a little boy who befriends a fish princess named Ponyo (Noah Cyrus), who becomes stranded onshore and wishes to become human, as her sorcerer father Fujimoto (Liam Neeson) tries to return her to the sea. We actually reviewed this film back when it first came out in theatres. While I found it to be one of Studio Ghibli’s more simplistic efforts, it’s still a pretty charming and beautifully animated fairy tale that is loosely based on The Little Mermaid, and will especially endear to younger viewers. John Lasseter also oversaw the English dub, which was once again done at Pixar. The Blu-ray also includes feature-length storyboards, the original theatrical trailers and TV spots, interviews with Hayao Miyazaki and Toshio Suzuki, and the featurettes Behind the Microphone, The Five Geniuses Who Created Ponyo, Theme Song Press Conference, Theme Song Music Video, Opening Event at Hibiya Scala-Za Theatre, Hayao Miyazaki Press Conference, Creating Ponyo, Ponyo & Fujimoto, The Nursery, Scoring Miyazaki, Producer’s Perspective: Telling the Story and The Locations of Ponyo. Ponyo is 101 minutes and rated G.